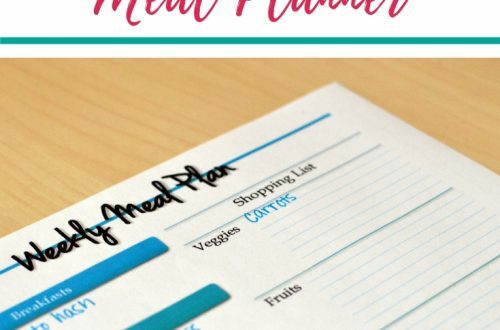 I recently shared a copy of the Weekly Meal Planner and Shopping List I use each week to plan my family’s meals and make shopping as pain-free as possible. But what happens when you just can’t think of meals to put on the list? Have you ever sat down with the greatest intentions of planning the week’s meals and starting the week off on the right foot, only to completely blank on what to make for dinner? You have a shelf full of wonderful cookbooks yet nothing is coming to mind? You are certain if you make that one meal again your family is going to rebel. You feel like you are eating the SAME. THING. ALL. THE. TIME. I mean just look at all these lovely cookbooks?! So why was I lacking ideas? This was me! I felt like we were trapped in some never-ending cycle of the same three meals. I, no kidding, would glance into people’s carts while grocery shopping and wonder what the heck they were making with the ingredients in their carts. 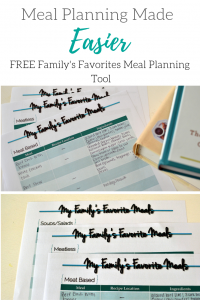 I couldn’t understand why, with so many resources for meals (I see you Pinterest), I was a complete blank when it came to creating a plan. It was frustrating. 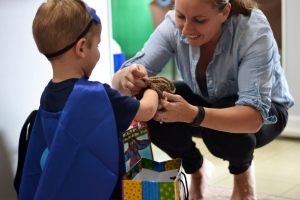 Sometimes I would try to pull up my Pinterest page and find ideas but often it often ended up with me flipping through the recipe, deciding it was too many steps and trying another one. This would last 30 minutes and my meal plan is still blank. Finally after being annoyed with the constant dilemma of “what should we have for dinner” I decided to create my Favorite Meals Index. 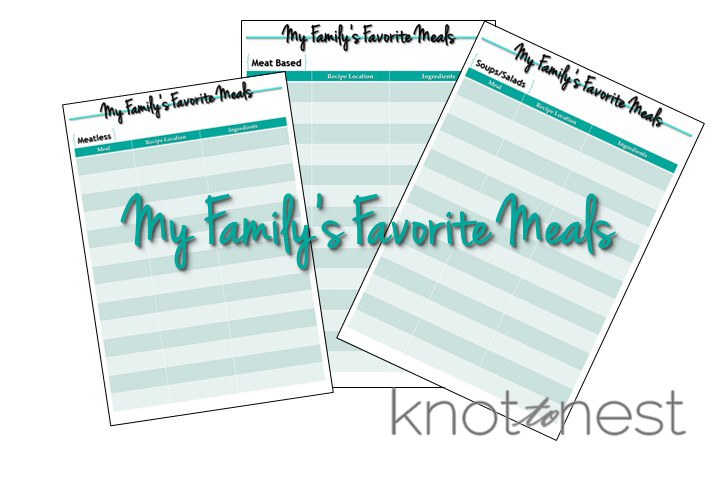 This was simply a single sheet that I have kept in my family binder, that lists meals my family likes and will actually eat. The sheet is broken up by type of meal/main ingredient. If you try a new recipe, and your people actually eat it (and 100% yes if they say they like it!) simply add it to the list! Now you have a list of meals to reference when you are stumped as to what to make for dinner. You can also reference this list when you’re deciding what meals to add to your weekly meal plan. You may be amazed by what meals you forget about! 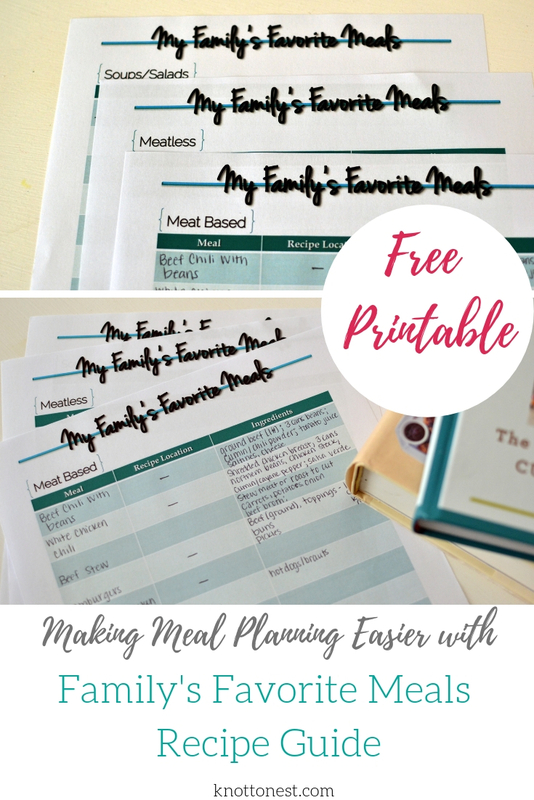 You can this resource in conjunction with the meal planning sheet and quickly plan what you will be having for the week. By quickly seeing the ingredients for each meal you can quickly know what to add to the shopping list without forgetting anything. If you would like to have your very own copy of the Favorite Meal Index click below. I would love to hear how this works for you so please comment below! 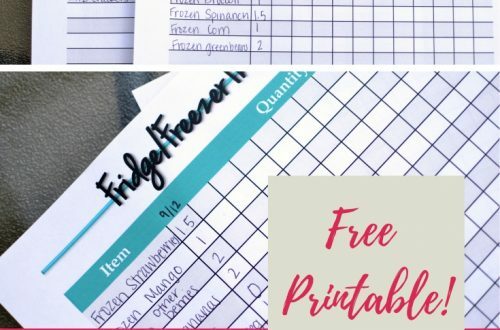 Let me know how the printable works for you! 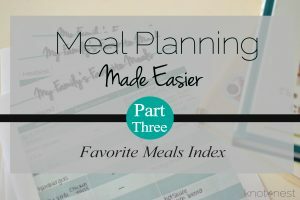 If you are looking for further tips on how to make meal planning easier, read parts ONE and TWO of this series.